– In-line feeding conveyor for the direct supply from the belt coming from the cages or for semi-automatic loading with the hand vacuum lifter. – In-feeding with one row of rubber rollers, candling system with one fluorescent lamp, with egg’s rotating motion to simplify candling. – Grader for 7 classes with 6 precisely scales. 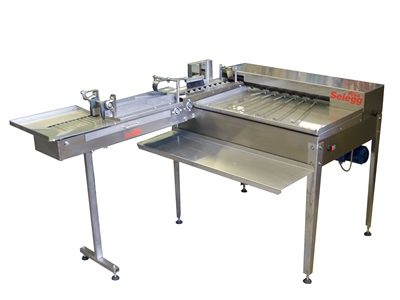 – Hand-packing table in stainless steel for easy cleanliness. Adjustable dividing lathes for all grades. – Electric power 230 Volts single-phase, 50 Hz, 0.18 Kw.